Special Price - 29% OFF! Claddagh creamer from Belleek China features an embossed Celtic knot motif; it may also be use as a condiment jug. 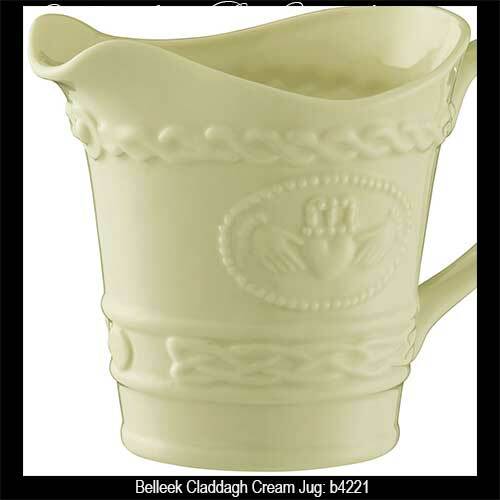 The Belleek Claddagh Cream Jug was Introduced in 2016. This Belleek China cream jug is enhanced with a Claddagh and Celtic knot-work motif that is embossed on both sides. The Belleek Claddagh creamer hold 10 ounce and measures 4" tall x 6 1/4" long x 3 1/2" wide. The Irish cream jug is hand crafted of fine china in Belleek, Ireland and it is gift boxed with Claddagh and Celtic knot history cards, complements of The Irish Gift House. Claddagh sugar bowl from Belleek China is enhanced with embosses Celtic knot-work; it may also be use as a condiment bowl. Irish teapot from Belleek features a double sided Claddagh design along with a Celtic motif that is embossed on fine china. 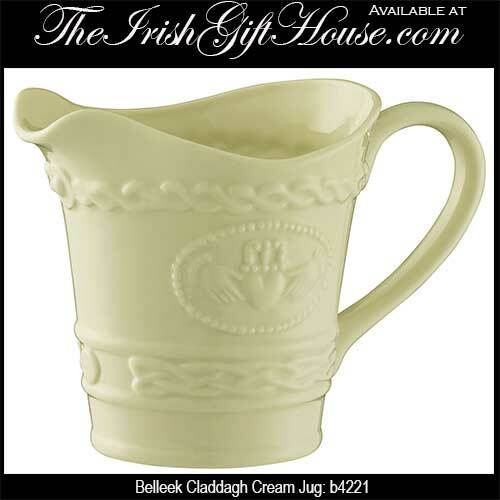 Belleek mugs feature fine Irish china that is embossed with the Claddagh along with Celtic knot-work.